Another Reason I love the QC: The Quad Cities throws one of the largest St. Patty’s celebrations in the U.S.! The Grand Parade kicks off the party on Saturday, March 18th at 11:30am. 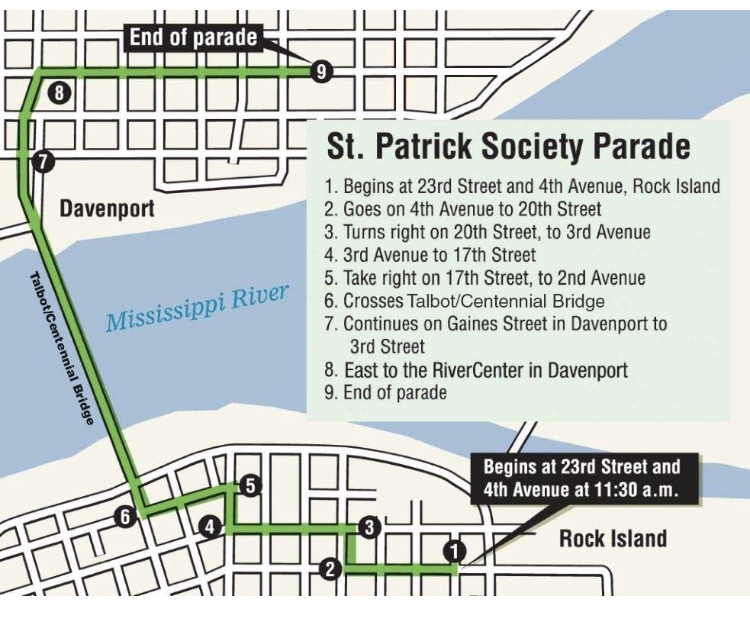 The parade starts downtown Rock Island, Illinois at 23rd Street and 4th Avenue and crosses over the Mississippi River ending in downtown Davenport, Iowa at approximately 1:30pm. This is the only bi-state St. Patrick’s Day parade in the country! Tens of thousands of people come out to enjoy the festivities. VIP Transportation is honored to be a part of the historic tradition transporting the Irish Mothers on our classic green trolley in the event for as long as we have owned the business. Irish Mother’s are nominated by members of the community and are women active with family, church and their community; they must “have a good sense of humor and demonstrate pride in her Irish ancestry”. We couldn’t be more proud to have these lovely ladies aboard our trolley each year! This awesome photo was taken by John Schulz, Quad City Times at last years parade. The QC St. Patrick’s Day celebration is one of VIP Transportation’s busiest days of the year! In addition to the Irish Mother’s, we have clans, friends and families that rent our vehicles all day and night. Typically, our buses start booking months in advance. We have groups that book the same vehicle each year. They start out bar hopping for an hour or two, stop at the parade and then head to Kelly’s Irish Pub for the day-long celebration. There are so many great events happening this weekend! Don’t miss Kavanugh’s, Me & Billy’s, and Harrington’s Pub are just a few of our favorite Irish parties! VIP Transportation promotes safe driving, especially on a day with a lot of green beer! Our Sedans, Limos, Trolleys and Boom Boom Buses are a safe, reliable form of transportation on this fun and exciting day! St. Patrick’s Day is only 22 days away, so call now to reserve a vehicle for the big day!